With the release of version 0.6 I took advantage of the additional command line arguments and added a few shortcuts to VIM. Now with a single key press from within VIM I can start debugging. F4 will start CodeClap and run to the same cursor position in VIM and F5 will break at main(). There are a million ways to do this with VIM/Bash but wanted to share in case it is useful for anyone. This is really cool, well done! I probably have to make the argument parsing part of the soon-to-be customization layer as well so that people can get even more creative with different startup behavior. It already replaced gdb and printf for most tasks. That is something I really like to hear :). The next update is right around the corner but it took/will take me a few additional days because of time constraints. I will then also write a bit about my immediate plans for 0.8-1.0. I tried to do this on 0.6.0 on windows 7, just calling the codeClap.exe but I can only get the program to start with an empty configuration. I tried to pass it the arguments by hand but got same result. Is it just a bug or am I missing something obvious? 4 months, 1 week ago Edited by joe513 on Dec. 12, 2018, 11:33 p.m.
Is there a space anywhere in the file path for the build directory? If so I think there is an issue with spaces on Windows that is supposed to be fixed in the next release. Can you share the full command that you are using in the terminal? Edit: Might also try using the full path names instead of relative paths, seems like I had issues with that in the past but I have not tried in the latest release. Best you try it with the now available 0.7.2. I tried it with that build and everything should work just fine. Just make sure to wrap the parameters in "" if they contain any spaces. I am on 0.7.2 now but still does not seem to work. 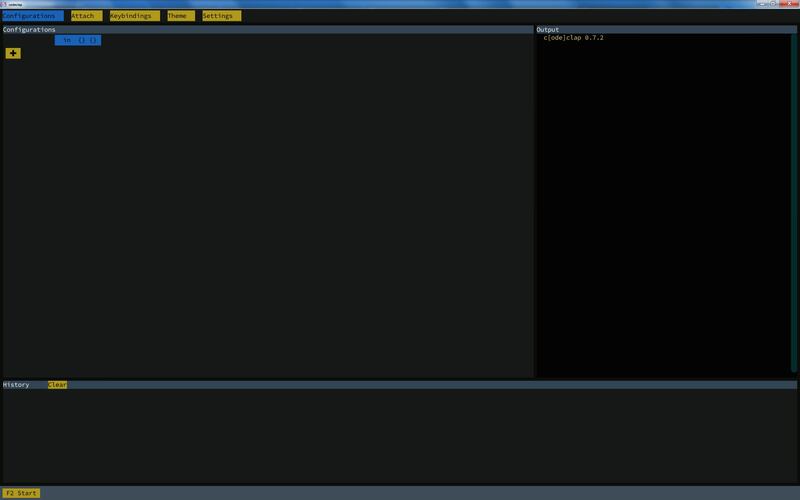 I'll post some variations of the command I put in the terminal and the resulting program screen I get. That's still a bit of a puzzler. At this point I suspect that it may not be caused by the argument parsing but maybe some problem during startup. If for example the .exe does not exist the behavior is as described and the normal window opens. I will add a few hints and more output capabilities to analyze this behavior further. Have you tried just dragging the same exe on the configuration window and starting it from there?